Based on AIA surveys, most design firms are small organizations of less than twenty people. The leaders of these small firms are likely to be very entrepreneurial, but unlikely to have any training in business or management. This is a guide addressing this important issue. 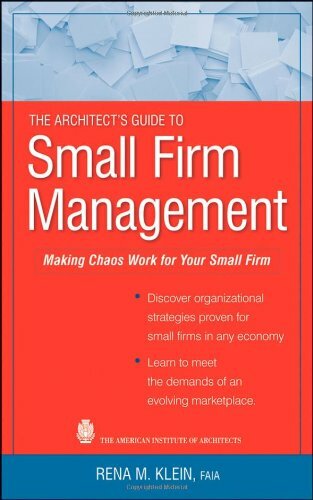 The author's insight will help small firm's succeed in the milieu of unpredictability by demystifying the essentials of firm management. Topics include, small firm archetypes, operational effectiveness, self-aware leadership, people management, lifecycle of small firms, firm financial health, scenario planning, and future trends. RENA M. KLEIN, FAIA, is principal of RM Klein Consulting, a Seattle-based firm offering business planning services, meeting facilitation, and management education to leaders of small design firms. Building on her graduate degree in management and her twenty years of experience as the owner of a small architectural firm, Rena regularly presents seminars on small firm practice. Her innovative work in this area has appeared in print and Web publications, including AIA's online Architects' Knowledge Resource. Move to a Larger Office?